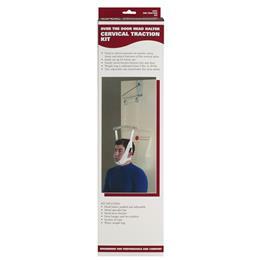 The traction kit is used to relieve pressure on muscle, nerve tissue and minor fractures of the cervical spine. It is easily set up for home use. 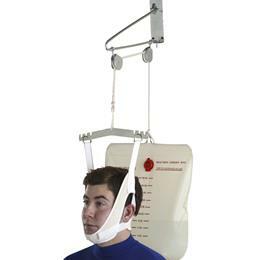 The sturdy metal bracket fastens over any door, and the weight bag is calibrated from 2 lbs. to 20 lbs. ; easy to fill with ordinary tap water. Weight bag is calibrated from 2 lbs. to 20 lbs.